Where is God when you are doing everything right but, because of someone else, everything is wrong? Cynthia Ruchti has walked this road and has spoken to thousands of people through her radio show. 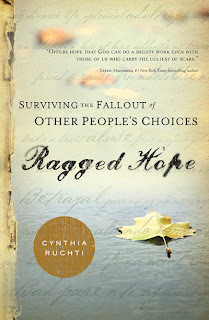 Ragged Hope is an insightful and hope-giving guide to assure you that God is every present and his love is unwavering. There is grace and a future in every situation--even (and especially) in those we did not cause but now live. Vetted by professional counselors and caregivers, this is the one guide you need to thrive no matter what situation of fallout you face. Ragged Hope is an interesting book and I haven't come across one quite like it. Each chapter features a story of an individual facing a crisis not of their making and then finding (usually) the faith to see through it. I found it to be an easy, entertaining and though-provoking read. Plus, the format made it an easy book to read in small doses, such as a few chapters in the evening or part of a devotional. My issue with this book is that I wasn't really sure what the purpose of it was. It isn't a devotional, at least not on its own. It also isn't really set up as a group study. The vignettes span such varied topics that I can't see it being especially useful to someone dealing with a specific situation. The only way I could figure out for this book to be more than just entertaining would be to refer a specific chapter to someone who was going through a situation that was similar. If you are looking for a general book about resilience from a Christian perspective, then you should consider Ragged Hope. However, if you are going through something specific and are searching for guidance, this book may be too general for you. The review is part of a blog tour by Litfuse publicity group. I received a copy of the book to read in return for an honest review. All opinions are mine and mine alone. I received no further compensation. Thanks for the review. The book sounds like a nice read, still. I do love the cover, it's really nice. Thank you for your thoughts, Melinda, and West Metro Mommy! Please know I take all your comments to heart. Yes, it really is a book that celebrates the resilience of the human spirit and throws a spotlight on hope's handholds for our journeys, no matter what the aftermath with which we're either dealing now, have in the past, or will in the future...as well as offering hope to those of us who watch a friend in pain and aren't sure what we can do to make a difference. West Metro Mommy, thank you so much for taking the time to read and review Ragged Hope.